If there was one non-education related topic that people in Australia and New Zealand wanted to talk with me about during my recent trip Down Under, it was America's relationship with guns. This was true of my trip to Greece in the spring as well. And in nearly every case, the question was some version of, "What the hell is going on?" I answered as honestly as I could, although not always this diplomatically, "There are too many people with access to guns who should not have access to guns." A case in point was last week's thrill kill shooting of a 22-year-old Australian baseball player in Oklahoma City by 15, 16, and 17-year-old boys. Another is yesterday's shooting at a Decatur, Georgia elementary school by a 20-year-old who was apparently "off his meds." 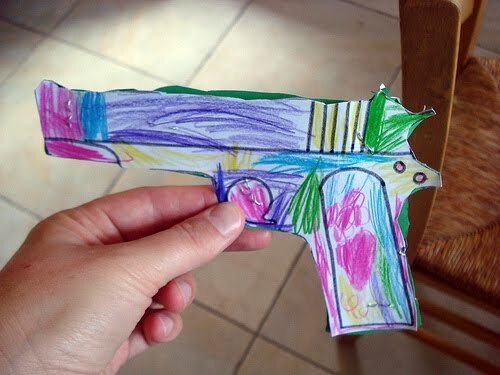 It's far too easy for kids and mentally ill people to get their hands on guns. No one believes that children or mentally ill people should have access to guns, yet tragically, we seem to be incapable to doing anything about it, and, from what I hear in my travels, the rest of the world is aghast. This may not be an education-related post, but it is about children. Fifteen hundred America children are killed each year by guns, that's an average of 4 per day, and tens of thousands more are seriously injured. Almost all of these are "accidental" shootings occurring in their own homes or the homes of friends or relatives. Most of these victims are boys, shot by a friend or relative. More than half of parents who own guns keep them in their homes loaded and unlocked: these people, by the NRA's own standards, are irresponsible gun owners. They think they've hidden their guns where the kids won't find them, but 80 percent of first graders say they know where their parents keep their guns. The kids in Oklahoma City may have acquired their gun by other means, but the majority of kids shooting kids with guns got those guns from their own parents. As for the mentally ill, nearly 90 percent of Americans say they favor more stringent background checks before people be allowed to purchase guns, specifically to be certain of the sanity of buyers, yet our politicians are incapable of making that happen. In contrast, in 1996, a lone gunman killed 35 people with a semi-automatic weapon in Port Arthur, Australia. This lead to new laws prohibiting all automatic and semi-automatic weapons, and imposed strict licensing rules. They also implemented background checks and lengthy waiting periods for all gun purchases. Gun violence has not been eliminated, but there has not been a single mass shooting in Australia in the 16 years since the laws were put into place. These laws were supported by a full 90 percent of the population, more or less the same percentage of Americans who report they support stricter gun control laws. No one can credibly claim that Australia has not been successful in keeping guns out of the hands of children and the mentally ill. In the US, a recent mass shooting at an elementary school in Connecticut in which 26 were killed, 20 of whom were kindergarteners, lead to nothing but a failed attempt by Congress to strengthen our background check laws and an insane call from many to arm teachers. I'm sorry, but I don't see how armed teachers will do anything but dramatically increase the number of kids accidentally shot and killed, adding to what is already a slow motion mass murder of American children. And that brings me back to yesterday's shooting at that elementary school in Georgia. A mentally ill man with an AK-47, explosives, and other weapons, got into the school's office, getting off several shots, yet you may not have even heard about it. Surprised? That's probably because no one was killed or injured. All the children are alive today, not because teachers had guns in their waistbands, but because a brave clerical worker named Antoinette Tuff talked to the gunman. That's right, she talked to him. By the time the police arrived, she had talked him into voluntarily disarming himself. When the police came through the door, he was lying on the floor with his arms behind him. She was armed with something far more powerful and effective than a gun: the ability to talk a desparate person down. If we need to arm teachers, this is how to do it. In fact, I would go one step further and say that every American should receive this kind of training as part of their education. As usual, I'm expecting gun rights people to come here to tell me I'm un-American or that I don't know what I'm talking about because I somehow got my gun terminology wrong or that "gun free" zones like those around schools are the cause of these tragedies. I will challenge these people in advance to come here with their own ideas about how to keep guns out of the hands of children and away from the mentally ill. And I will also point out that every school shooting up to now has taken place in schools that did employ armed security, some even had their own police forces, yet people were killed and injured. Only this time, in a school that was armed only with words, did we manage to walk away with no injuries or death. Only this time did we have a gunman give himself up without carrying out his unthinkable plans. Please at least think about that before you write to me.